This is an officially licensed Harry Potter costume. If you are a real Harry Potter fan then show your love with an amazing wizard costume. Fantasies always put a big smile on our faces and twinkling shine in our eyes. Plan a party full of magic and mysteries with a special wizard wand or witch broom. Let him wander in his imaginations and dress up like one of his favorite character. Bring more smile of your kid's face with these amazing party outfits. 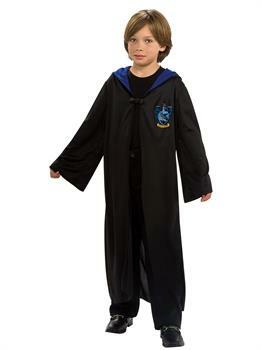 Show your creative mind with Harry Potter - Ravenclaw Robe Child costume.